I'm so happy and excited to announce guest hosting of the event EP Series-Herbs & Spices started by Julie of Erivum Puliyum. I would like to thank Julie for giving me the opportunity to host this wonderful event. The theme that I have chosen is "Curry leaves or Dried red chilies". That's really a spicy and flavorful combination. Isn't it? Curry leaves are my personal favorite and I always try to add them in my cooking wherever possible. :) Let's have a look at some health benefits of curry leaves and dried red chilies. Curry leaves have many herbal medicinal properties and Also known as 'sweet neem leaves'. Curry leaves improve digestion. They also help to reduce fats from our bodies. It reduces the level of bad cholesterol. Curry leaves are extensively used in Ayurvedic medicine for treating nausea, vomiting and diarrhea. Curry leaves are rich source of vitamin A, calcium and folic acid and among other things can prevent early development of cataract. This is an ideal herb for people suffering from the ill effects of diabetes. As we all know dried red chilies are known for spice or heat but they are nutritive too. It contains vitamin C and carotene in high amount. Red Chili has the ability to fight against inflammation. The event runs for the period of 1st August- 31st August 2012. Recipe must be linked to this Julie's event announcement page and to my page. You can link both Veg & Non Veg recipes. Send in any number of entries. You can link in your old entries too but specific to the herb & spice, just add the link & logo, no reposting required. Usage of logo is appreciated for all entries. There are 4 awards for the BEST INNOVATIVE RECIPE AWARD, TOP CONTRIBUTOR AWARD,BEST HEALTHY DISH AWARD & PARTICIPATION AWARD. I know cooking with some specific spice and herb is quite challenging. But I am sure that you will come up with loads of innovative ideas and explore your creativity. This is the first event hosted at my space, I am so excited and looking forward to your support. Send as many entries as you can and make this event a huge success. Nice theme dear..will send my entries soon! 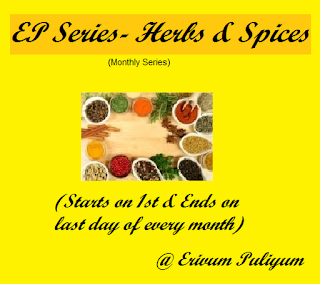 Thanx for your interest in hosting the EP Series event,will add it at my space too!! A wonderful event. will send my entries soon. Happy hosting. 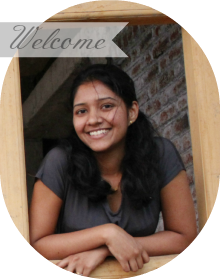 love this theme..i too will link my entry shortly..
happy to visit your blog . I am new to this blogging . I want to participate in your event. i understood how to link my entry to your event but don't have a clear idea how to link the same on Julie's page as you have said. Kindly help.